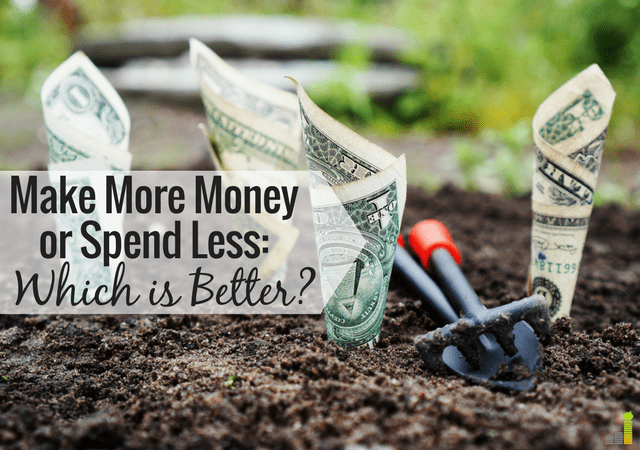 There is often a debate in the personal finance community about which is better to achieve financial goals: spending less or making more money. I acknowledge that spending less is a great way to start a debt repayment journey or to supercharge an aggressive savings goal. However, the reason I don’t like this as a long-term strategy is that there is only so much you can cut. I’ve spent the better part of my adult life shopping at thrift stores; not having a TV for several years; being a one car family and more. However, I started to make real strides with my debt, my retirement goals and even with my overall confidence once I started to make more. None of us are bound by a boss’ gift of a five percent annual raise. There is always more money to be made; more opportunities to find; and more creative ways to hustle. It made such a profound impact on me because frankly, I’d never considered it before. Self-employment scared me. All I was worried about was trying to make it on a variable income, but this commenter took it and put a positive spin on it. Also, there’s no rule against dog sitting or renting out a room in your house or tutoring or anything else while you’re still working a 9-5 job. I personally have been blogging for seven years, but I’ve only been self-employed for three years. I blogged and had freelance writing clients while I taught at a university for several years before switching to full time self-employment. There I said it. Making more is just more fun than spending less. When you have to cut out expenses, you lose out on the things you enjoy like going out to eat with friends or having cable to watch a football game. We rarely go out to eat unless someone gifts me a Panera gift card. I love finding deals on used clothes. A few weeks ago at my husband’s white elephant holiday gift exchange at work, I was seriously baffled that no one wanted the $25 gas card that was up for grabs. You better believe we took it home. Yet despite my propensity for frugal living, I still enjoy the pursuit of earning more and still rely on earning more to pay off my debt. There are definitely other things I could cut out of my budget, but I don’t really want to at this point. I’d rather make more. I don’t think this is a flaw or greed or a bad thing. Rather, I’ve spent much of the past few years being married to a student and being the primary breadwinner, and I’m tired of cutting things out. I’m excited by the prospect of growing my business and making more and that’s the method I’m using right now to achieve freedom from debt and eventual financial independence. 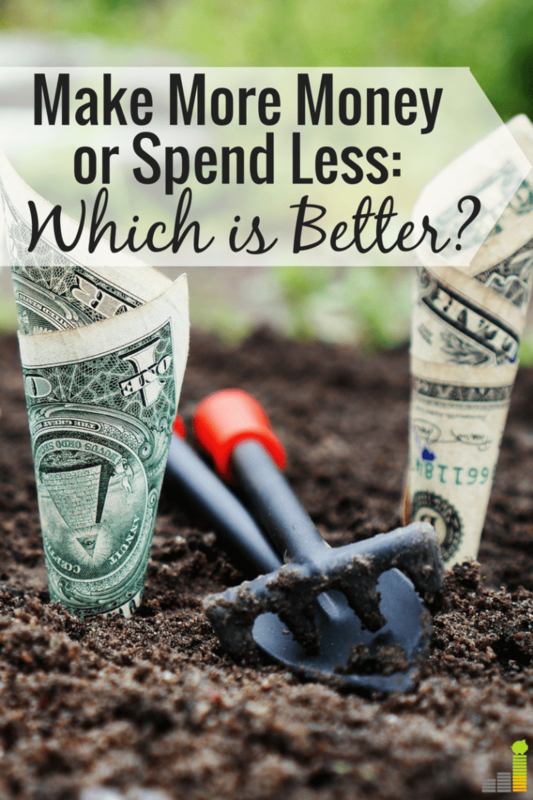 What do you think is a better method: spending less or earning more? Why do you think we’re tempted to just cut instead of looking for ways to earn more? What is one thing that’s worth it to you to spend on instead of cutting it? I love this! I freelance on top of my 9-5 job. A lot of people think I’m crazy for essentially working two jobs, but honestly, just like you said, it’s fun. It’s so fun to see my business grow and much more fun to make more money instead of spending the time and worry penny-pinching. Thanks for sharing, Cat! People can cut expenses to the bone but there comes a time when the answer is obviously to make more money. For example, a person could go without insurance and save hundreds, if not thousands, of dollars a year, but that is not at all wise. Wouldn’t it e better to get a second job to earn the money so you don’t cut insurance? I’m all for cutting expenses but ultimately more money is usually the answer. I have to admit I’m more in the side of cutting expenses over making more…at least initially. This is especially true if you’re in a higher tax bracket, because you’ll have to make significantly more money through earning than you would by saving. For example, assuming one is in the 25% tax bracket, they would have to make $133 to be equivalent to saving $100 from money you’ve already earned (say by cutting cable or other expenses). This ignores FICA taxes, which for the self-employed are especially high. So…I say first optimize your budget to make sure you cut things that aren’t important to you and then pursue earning more. Earning more will likely make the biggest difference like you said, you just don’t want to lose out on the efficiency of cutting expenses too! I was definitely one of those people who believed cutting expenses was the way to go. But last year I realised it would only get me so far. So I made it my mission get a new job and increase my income. I was able to almost double my salary. Now I believe its a balance between the two and will be working on other ways to increase my sources of income. Well I think you and everyone else I’ve been interacting with the past few years knows where I stand on this : ) I think making more money can be fun, but burnout is a real possibility, and you need to watch out for it. Staying on top of things and being self aware are both really important. Both are important, and I think which one you should focus on all depends on your situation. For example, if you have a high income but are spending beyond it, you should focus on frugality. There are plenty of wealthy people who end up bankrupt because they didn’t have control of their spending. Or for someone who has chosen to be a stay at home parent for a period of time, it makes sense to cut back since you’ve opted not to focus on income/career for that season of life. But I agree that cutting back has hard limits while earning more does not. Those gains can come at a price of time & stress but they can be well worth it if you keep that side of things in balance. Great examples, Cat! The other thing to consider is that cut expenses often rise despite efforts and unless you increase your income you still lose. Keeping income the same while food and utilities rise across the world is hard. Increase income but like DC said, not at the expense of burnout.